We take baby massage lesson once a month and I massage her every day. She likes it very much. When I massage her on her sole, she relaxes and smiles a lot. I began Yoga with the same teacher of the baby massage. During my lesson, Miyu lies by me and watches me. When she cries, I should carry her. So I cannot do all of the poses... But because of thelessons, now I could lose weight (* v *)!!!! These are the dolls for girl's festival, at the 3rd March. My parents got them for Miyu. In Japan most of girls have one set at her first year. We display it for about one month till the day. Now I'm thinking of sewing her a new diaper cover. Last week, we met some mothers who use cloth diapers and are trying EC. They have cute handmade covers and they stir me up. I couldn't take any pictures at that time but I'll post about them after our second meeting. Enjoy yoga. It's so fun! 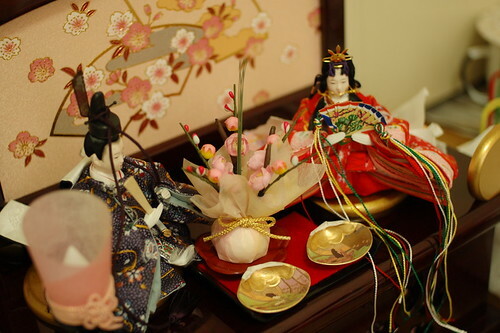 I like your dolls for Hina-Matsuri. They are pretty. Do you have the complete set or only O-Dairi-sama and O-Hina-sama? Glad that you're back. Your baby is so cute and I enjoy seeing pictures of her. I know you are so proud! Baby rolls! ^__^ Love those little folds! She is adorable. Oh man, Miyu is SO CUTE! I just love her little dandelion-do. Glad you're all well and happy. So lovely to hear again from you and from Miyu. I am sure you are sewing up something beautiful and comfy for her! I look forward to seeing what you make. It´s yoga really that good ? Hi Mai, wow Miyu is so adorable! You're a great mom. I hope to see more photos of Miyu. http://mycreationsandinpirations.blogspot.com/ this is my blog i am sharing my creatives..
She is lovely!!! You must be a very proud mum! Dearest sweet mai, she is growing up so beautifully! I adore her so much! :) Have a lovely merry happy week and love to yoU! Your baby is really wonderful!! She's a lucky girl, having a such creative and caring mum like you!!! Miyu gets cuter and cuter each time you post a picture of her. She is absolutely adorable. I am watching the tsunami on TV. I hope you and your family are OK!!!!! Worried about you. Pray you and your loved ones are all safe. I'm in shock with the pictures of the tsunami... Hoping you're safe. We are OK! Thank you very much. Today was the earthquake - I hope you and Miyu and your family is ok! We think of you and wish you the best! I've heard about the earthquake. I suddenly thought about you and your family. I'm glad to hear that you're ok.
Hope all your family and friends are fine, too. I'm very happy to heard that you and your family are all safe. I am so grateful to hear that you are safe. Please let us know if anything is needed. Espero que estén muy bien después de este terrible terremoto. Estermo en contacto. Un abrazo muy fuerte a la distancia. My Blessings for you, your family and all the people in Japan. The first thing I thought when I saw the earthquake and the tsunami was , Mai !! I have been reading your blog every since I found your tutorial about the little monkey baby. I came to say I am so glad you are safe and that I am praying for you and your family and all of Japan. Stay safe. Just saw the news ad like many others I thoughtof yound your family. I'm glad you are well and will be praying for our people. that should have been ayour not our my keyboard isbad. I'm so happy that you and your family are ok. I was immediately thinking of you when I heard about the earthquake. Oh, Mai, I just saw the news about the quakes. As soon as I saw the headlines I was so worried for you and Haru and little Miyu. I'm so glad you're all safe! What a relief! I was so worried about you, your husband and sweet Miyu! All of our thoughts are with you and all Japanese families. I'd never commented before- but I'm so glad you're ok.
our thoughts and prayers are with all of you there. I thank God that you are your family are safe. I immediately thought of you when I heard the terrible news. I have never writtent to you before, but I love your blog and your beautiful baby girl. you and your family are in my thoughts and prayers !! I'm praying for your country! Lots of kisses from my family and I directly from Portugal! I'm so glad you and your family are safe. You remain in my thoughts, take care! Hi Mai, so glad you and your family are okay. My heart goes out to Japan and the other countries suffering from this terrible disaster. We're praying for you, your family and for your country. I'm so glad you and your family are ok! Thank the Lord. Sending you a big hug from Spain, glad to read you and yours are safe. Pls stay that way. Goodmorning...We are sorry for earthquake in your country..I hope you are all well and japan will recover soon.greetings from Turkey. I hope that the power plants will be under control as quickly as possible. I am glad to hear you and yours are fine. The whole situation has made me rethink my position towards atomic energy. I didn't know power plants needed cooling even after being "switched off". Hope that Japan will recover quickly from this catastrophe. My family is OK. Miyu and Haru are sleeping by me. There are lots of aftershocks. I'm worrying about the disaster area. Thank you very much again. I'm happy with your comments and e-mails. Me alegro que ustedes estén bien. Mis oraciones son para todo el pueblo de Japon. Un abrazo muy fuerte desde Costa Rica. So happy to hear you and your family are all right. It's such a disaster. Greetings from Belgium. I used infant massage on both of my babies, they are now 13 & 10. I used almond oil for the massages. I took classes at our local hospital. After the massages each night I would swaddle them in a receiving blanket and they would drift off to sleep. Both my girls starting sleeping through the night at an early age and I attribute this to the massages. Miyu is so beautiful! I hope you and your family are still doing well. We watch the news here and are so worried for the people of Japan. Awesome interesting information and attractive.This blog is really rocking...Yes, the post is very interesting and I really like.